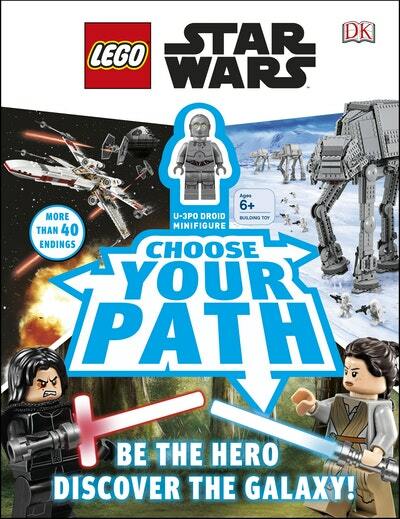 Be the hero of this book and choose where to go in the LEGO® Star Wars™ galaxy. Choose how to battle, who to team up with, which side of the Force to join and much, much more! Read the page, then decide where to go next by selecting one of two options on every page. Do you want to travel around Jakku by speedy quadjumper or by four-legged luggabeast? Will you choose to join the rebels over Scarif, or to fly after the Inquisitor? On Mustafar, do you dare to battle Anakin or will you join him on the dark side of the Force?! Navigate the book and learn all about key LEGO Star Wars characters, creatures, vehicles and locations. Every page is packed full of facts, stats and stunning photographs of LEGO Star Wars sets and minifigures. Once you reach an ending, go back and see where the paths will take you next time! LEGO Star Wars Choose Your Path comes with a cool LEGO Star Wars minifigure to join you on your adventures through the galaxy. LEGO, the LEGO logo, the Minifigure and the Brick and Knob configurations are trademarks of the LEGO Group. ©2018 The LEGO Group. Manufactured by Dorling Kindersley, 80 Strand, London, WC2R 0RL, UK under license from the LEGO Group. © & TM 2018 Lucasfilm Ltd.
Love LEGO Star Wars Choose Your Path? Subscribe to Read More to find out about similar books.